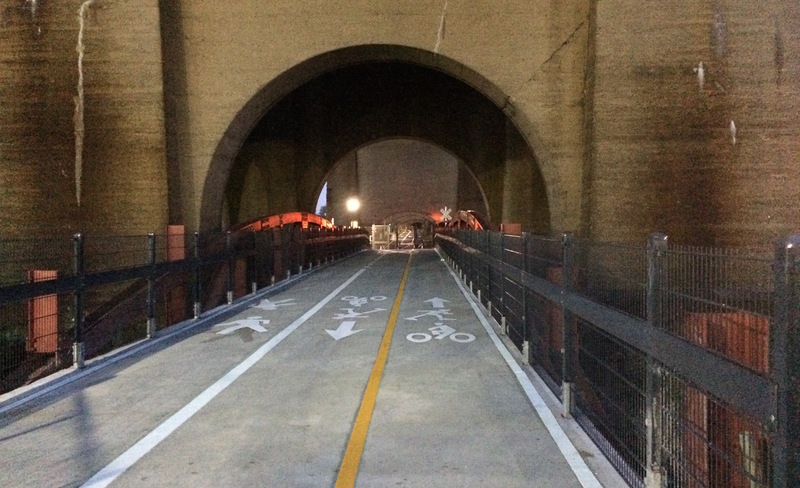 The Randall’s Island Connector is set to open this weekend. A greenway link between the island and the South Bronx, the connector has been on the agenda of advocates and electeds since the early 1990s. The project will provide a grade-level crossing over Bronx Kill from E. 132nd Street in Port Morris, under an Amtrak bridge, allowing people to get to the island on foot and by bike without having to contend with the Triboro Bridge. The connector was built by the city’s Economic Development Corporation. According to South Bronx Unite and the web site Welcome 2 the Bronx a grand opening with a ribbon-cutting is scheduled for Saturday. There will be a celebratory ride starting at 10 a.m. and the ceremony is set for 11. Details here. As always with non-automotive infrastructure in this city, “Better late than never”. Hasn’t it been pretty much done for months? (note the 2 month old photo at the top of this article) I had expected the NYC Century to use it this year, but instead we ended up going over the Triboro at a walking pace. Built with highway style lanes that will encourage people to bike fast on a path that requires caution. The path, particularly the pedestrian side, is narrower than it should be, but designing a bike path to slow people down as you’re suggesting is bad design and only serves to discourage cycling. No advocate will ever publicly call this path too narrow though. We don’t question design here. If few people walk there (likely) then cyclists will rarely have to slow down. Sightlines are good enough that you can ride 20 mph there and still see if there’s someone to slow down for. designing a bike path to slow people down as you’re suggesting is bad design and only serves to discourage cycling. This idea that you and many other cyclists have that anything that doesn’t let cyclists ride as fast as they want for even one second is bad and anticyclsit is why these lanes are a mistake. Because this path is too narrow for you to ride that way. Paint a lane far too narrow for people to reasonably be expected to stay in it and you’ll encourage cyclists to become frustrated when people inevitably walk outside of it, and discourage them from slowing down on those rare occasions (people walking here) that they absolutely should. This is absolutely contrary to my experience on recreational paths like this. The design (narrow path) engineers conflict. The paint pretends that conflict doesn’t exist. Build a wide path that allows separation. Or embrace the shared aspect of a facility. Still need to go over Triboro. Finally but we need safer connections on the Bronx side to the coming South Bronx Greenway extension on Bruckner Blvd. Drivers fly along approaching service roads and East 138th St is a death trap. This is exciting. I rode by about a month ago and it wasn’t open yet. So I feared it would be Spring before it opened. Glad I was wrong. My guess here is bike and pedestrian traffic will probably be so light most times none of what you mentioned will be a major issue. To me it makes more sense to design for the majority situation than worry about outliers. Yes, there may be a few times where cyclists and pedestrians conflict, but I see value in the lines telling people where they should be. Not just to separate pedestrians and cyclists, but also to separate cyclists going in opposite directions. That to me matters more. Without lines, cyclists will often be riding wherever they feel like, with the inevitable near misses or playing chicken when two cyclists going opposite directions pass each other. At least the lanes clearly indicate where you should be riding. >At least the lanes clearly indicate where you should be riding. So people will ride faster expecting everyone else to follow the paint. That’s only a reasonable expectation when the paint provides a reasonable amount of space. It doesn’t here. They give the data for power versus speed. 185 watts is about what I can do continuously for 1+ hours. That translates into 60 kph (37 mph). Now we just need to take some highway space from automobiles so people can use velomobiles to their full potential (or build the bike viaducts I often talk about). Pretty cool that a person can go at these kinds of speeds on their own power. Why not both? And add in the LIE while we’re at it. With a nice velomobile I can easily see myself riding all the way out to where it ends at exit 73 and back. It opened today and it looks Amazing! I rode my bike from NJ across the GWB so that I could ride my bike on it on opening day. YEAHHHH!!!! Does anyone have details on when the connector is closed for train traffic? I’m wondering if there is some way to know ahead of time since it would be awkward to get to the connector and find that it is closed for the next hour. I don’t understand why closing the path would be necessary in order to move trains. The trains run on the tracks that run above the bike path. It is a separate set of tracks that crosses the path at grade. If you look on google maps you can see the tracks that run above the path and then a set of track that are perpendicular to that which run at the level of the path. On the map, the at grade tracks end at the New York Post. I realize the Triborough is an alternative, that’s why I only said it would be “awkward” if the new path was closed for an hour. This path is way nicer than the Triborough (and it looks like they have done extensive plantings which are going to be lovely in a few seasons). Ah, that’s true. Sorry for my brain fart. I was actually there yesterday, and I crossed the new bridge for the first time. I did see those grade-level tracks; but I somehow forgot about them until you just reminded me.